I have acquired an "C" clamp with an odd mechanism/operating system. Hopefully the images will tell the story. The adjustable shaft has horizontal edges that catch within a short threaded barrel, turn the shaft a 1/4 turn and the shaft is loose to adjust up or down. 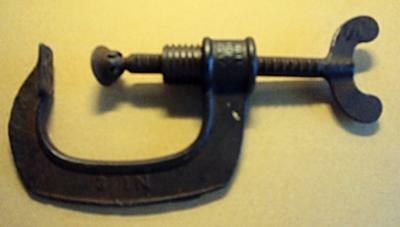 in other words it operated by holding the clamp to the item to be clamped with the threaded barrel backed inside the housing, 1/4 turn the shaft to free it up and place the swivel head at about the surface to be clamped, turn the shaft 1/4 turn to engage in the barrel and twist away until snug. does this need explaning why it apparently did not "take-off"? "PATT" . . . the 2nd "T" is not at all clear, might be a "P"
"JUN.18" . . . the "8" is not at all clear. "1872." . . . the "2" is not at all clear. I could not find a date approximating the one on the clamp body, either in applied for or granted fields of patents but I could have easily missed it. Any help someone/anybody can give me will be appreciated. 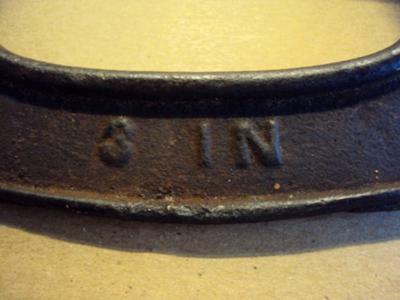 You probably know as much about this clamp as anyone. 100 years ago there were many many tool companies. Many fell by the way side. Many others were bought by the big two of the time, Stanley and Millers Falls. The point is that this clamp may have been made by anybody. A knowledgable clamp collector may possibly be able to identify it by its distinctive sqared off "C" shape and of course the quick release mechanism. 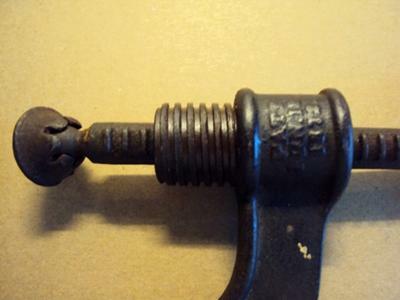 I have been trying to buy old c clamps with the wing nut type end on the threaded bolt, just because I prefer them to the modern sliding cross bar type. Prices are as much as a good quality modern clamp. The quick adjust on yours will probably make it worth much more.